As I sit here reading the Collected Letters of Charlotte Smith, edited by Judith Stanton, and find myself just devastated by what the life of a woman sold off, gotten rid of to a ruthlessly abusive and extravagantly egoistic spendthrift gambling heir — not to omit terrifyingly violent and sexually promiscuous — to a great property could be, all 800+ thin pages, with annotations, biographies, notes, locations, I find myself remembering back to a time in the 1970s when the most that could be found in print by Charlotte Smith was two of her novels in staid Oxford University Press editions (Emmeline and The Old Manor House). What a difference 40 years can make. I asked myself, how did I first meet this woman author? and in what form was my encounter with another equally important author for me from the 18th century, Ann Radcliffe. 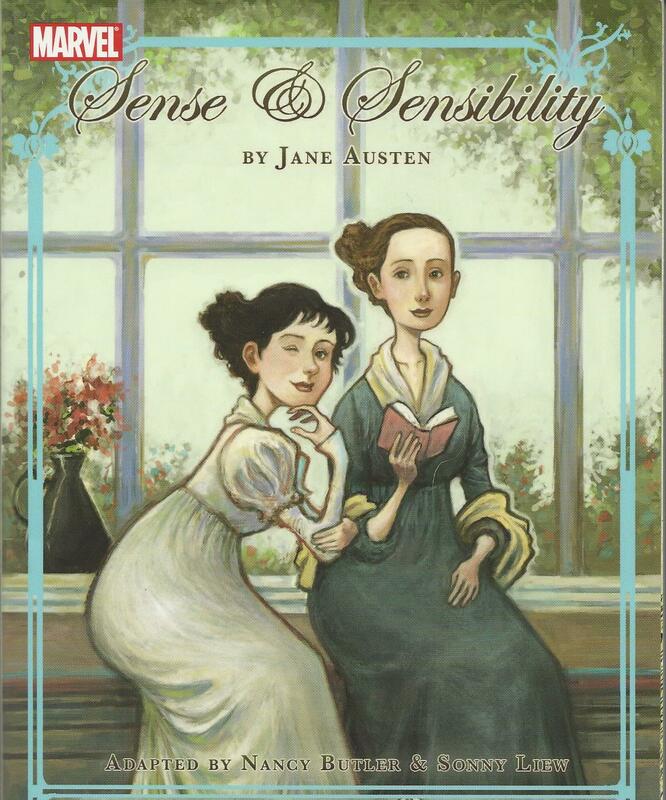 I did once before my recent moving back into memory to remember first encounters with Jane Austen, write about how I first met Fanny, now Francis Burney, Madame d’Arblay. Unlike most recent and mostly women readers, it was not in college because I was assigned Evelina (or as a graduate student, Cecilia say). No it was a single abridged volume of her journals and letters that will soon reach 24 thick fat volumes. As I said, I was led to seek out some longer version, as it happened a 3 volume one, in a bookstore on 59th Street, a stone’s throw away from Bloomingdale’s, The Argosy because (perhaps unbelievable today) at the age of 23 or so (my first year of graduate work) around on the open shelves of the Brooklyn College library I had found a 1797 3 volume edition of Ann Radcliffe’s Romance of the Forest. Even then I thought it was crazy to have such volumes on the open shelves. It was an entrancing visceral experience to read in that form. 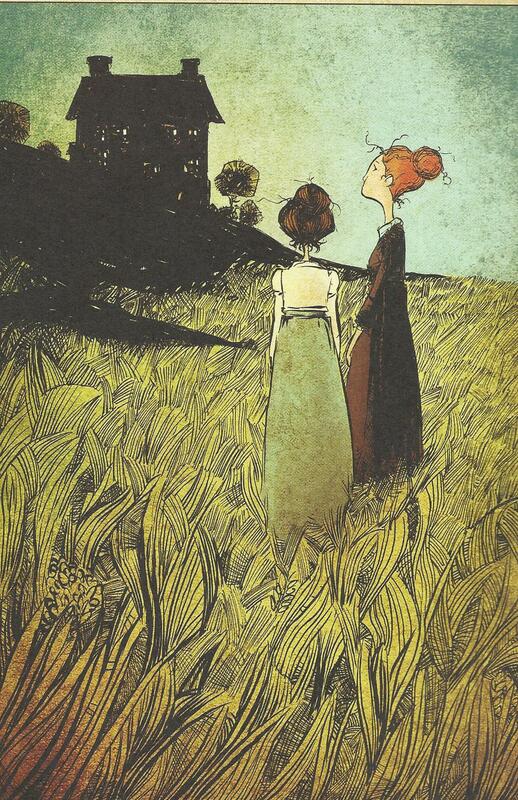 No illustrations, but the original type, the yellowing pages, the delicate elegant lady-like volumes. I have since written a lot about this book and led a group on line reading and discussing it. Yet I was drawn in by the hero, by the radical politics of the book, by its acid corrosive anger. I fell in love when I began to go to the Library of Congress, one and two nights a week, and all day Saturday and read in a microfilm form (!) the first edition of her Elegiac Sonnets. It was in 1984, I had had a second baby and was seeking to find some place where I could commune with minds like my own in books. I was 37. Scrolling down and turning the wheel on one of those machines I read her poetry for the first time. Then I found on the shelves below the reading room (which in those day “readers” with cards could explore) equally elegant volumes of Smith’s novels. I can no longer remember which novel I put on my very own shelf (each reader had a shelf he or she could keep books in behind the rotunda of the reading room), only that it was an uncommon one I did not have to read as a a microfiche, and in an early later 18th nearly 19th century elegant lady edition. I do remember becoming so intensely engaged. 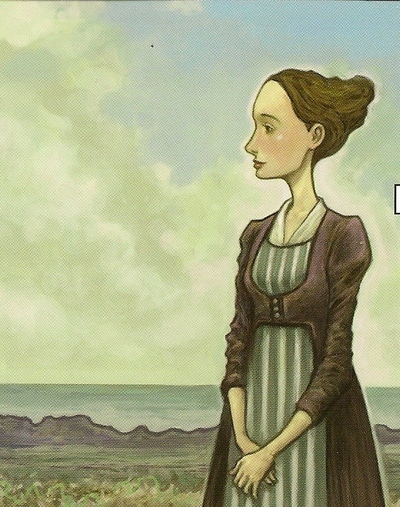 It was a heroine I could identify with, one with adult thoughts. Could it have been Marchmont? Then shockingly (to me) I came one day to find my three-volume set gone. I was desolated and worried I would be blamed. Had someone stolen “my” books? I was told by a blasé clerk, “oh no, not to worry, no blame, someone did probably take them.” He seemed confident that they would not leave the library but I was not. What was true was I had lost access to this book. I was at the time not teaching in colleges as yet, I had not gotten any shelf at the Folger, I was cut off from college libraries. I sat in my chair and cried. This wouldn’t do, people around me were uncomfortable. So I phoned Jim and he came by car and picked me up. Rescued me as we used to put it. I now have an extensive library of both Radcliffe (48 volumes, including xeroxes) and Smith books (36, including hand-written extensive notes), primary editions in facsimile, modern paperbacks, older hardbacks, and marvelous secondary studies for them both. I have elegant lady editions too of novels of Sophie Cottin, Madame de Genlis, and Isabelle de Montolieu (plus an array of later 19th century hard backs, facsimiles, secondary critical works and xeroxed books and essays). 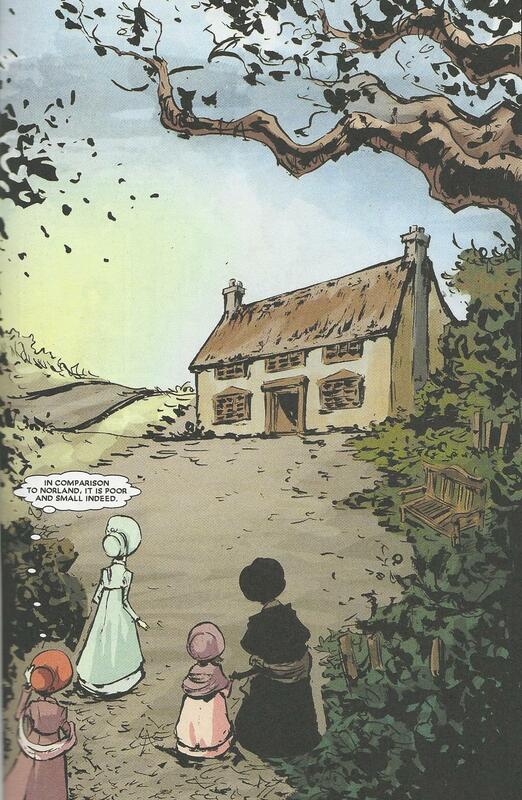 I’m not going to attempt to say what The Romance of the Forest and then Old Manor House together with Elegiac Sonnets meant to me then as I was no longer at the impressionable age I “met” Jane Austen and Jane Eyre. 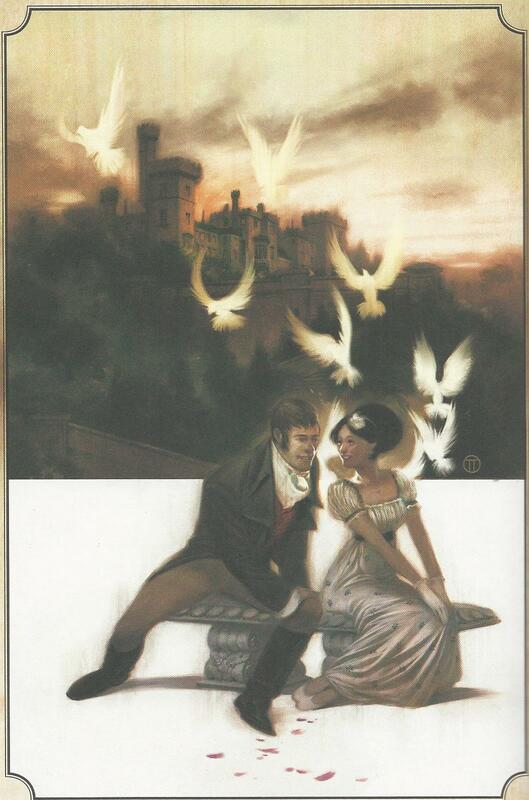 The truth is in some moods I prefer The Mysteries of Udolpho to Austen’s Emma. Yes. The landscapes of Radcliffe and Smith provide the occasions, the impetus for the thoughts. 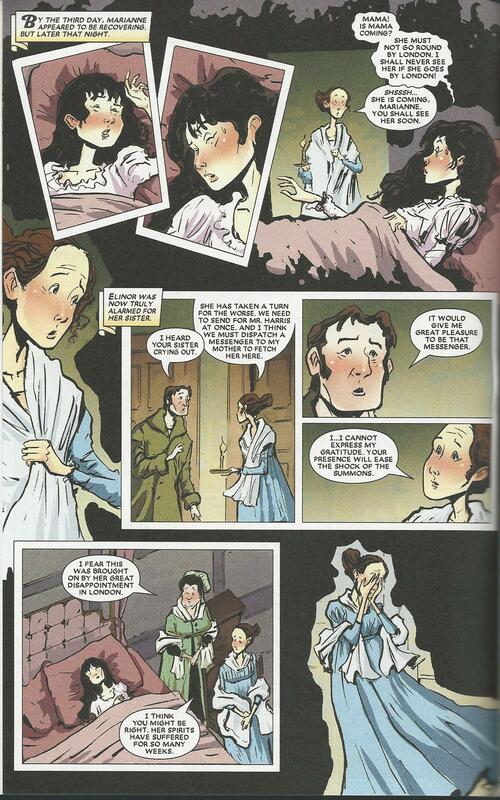 No matter how hard the revisionist readers of Austen argue only in Persuasion and the gothic moments (these hedged in by ironies) of Northanger Abbey does this happen and then she’s not political. I find in Smith all the radical politics that Austen is said to have and doesn’t. I can say I was in both cases led into the volumes from the melancholy of the tone, the feminine structure of the sentences, the nightmares of Adeline, and the poetry of Smith, which to this day sustain me still, and think the images found in Angelica Kauffman’s work “match” thematically and aesthetically what is found in all these women. In the case of Radcliffe, I was at the end of graduate course work and teaching; in the case of Smith, I was post-doctorate. Since then I’ve written extensively about them both, here on the Net, in my blogs (Radcliffe, Smith), and in published and conference papers too. Next time I shall return to my women artists. I’ve delayed too long but first up we’ll be in the eighteenth century for that feminist businesswoman par excellence, Angelica Kauffman. And I hope not to long from now to be in a position to discuss Smith’s letters and life in a way I’ve not begun to do, not having experienced what I just have in reading her letters. Although out of season, as this is not a well-known or familiar poem to Radcliffe’s readers or romantic scholars (let alone a wider audience), I’ll end on an unusual moment in print for her: she is cheerful (! ), at home, on a winter evening, with light, music, books, with her favorite dog, Chance. Where watchfulness and slumber blend. Exalt, or soothe th’ awakened mind. And all his diapason crowd. As o’er the frame his white wings dash. And brighter is the taper’s blaze. 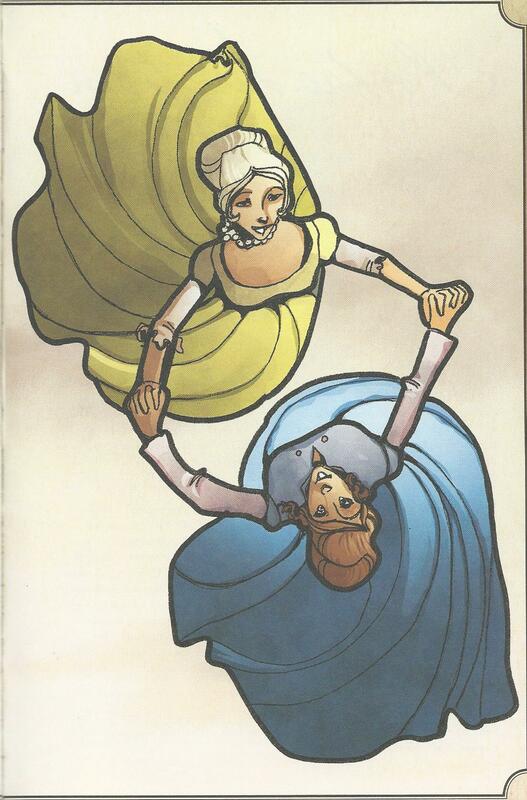 Then, let the merry tale go round. Surely it’s time to write about Austen here again. Long overdue some might say. 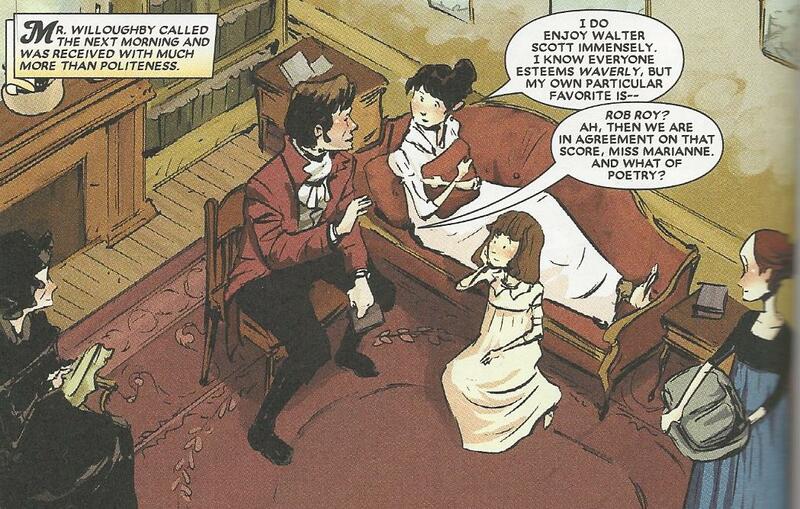 Last night I read and perused the latest graphic novel of Northanger Abbey, words chosen and written by Nancy Butler, the artist Janet K Lee; colorist Nick Pilardi, letterer Jeff Eckleberry. It’s a Marvel product and since in just the way the company that produces a film predetermines the shape and much that is indefinably the film so the comic book publisher Marvel predetermines elements of the commodity they sell. Thus it’s no surprise if the other Marvel graphic novel I own, which I also reread and looked at the pictures for far more carefully and deeply than I’ve done before, Sense and Sensibility, also by Nancy Butler, but this time artist Sonny Liew, colorist L. Molinai, Letterer Joe Sabino, showed a strong family resemblance. Both have marvelous large pictures at the close of the most striking of the panels that are smaller inside the story — and here both are highly original or they allude to famous works of art or movie/movie genres. 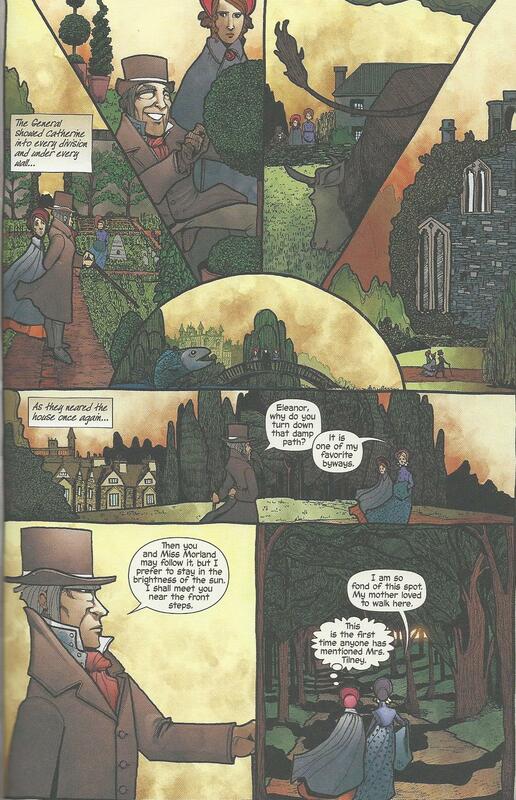 I was surprised at how much I enjoyed them — I have a strong tendency to see these books as comic books but under the influence of Simon Grennan’s Dispossession, which I bought at the Trollope conference meeting, and is a graphic novel adaptation of Anthony Trollope’s John Caldigate, I began to look at the individual panels seriously for the first time, and could see they are genuinely art; in these two cases expressionistic, and project a general outlook and mood, not necessarily Austen’s but a reading of her. 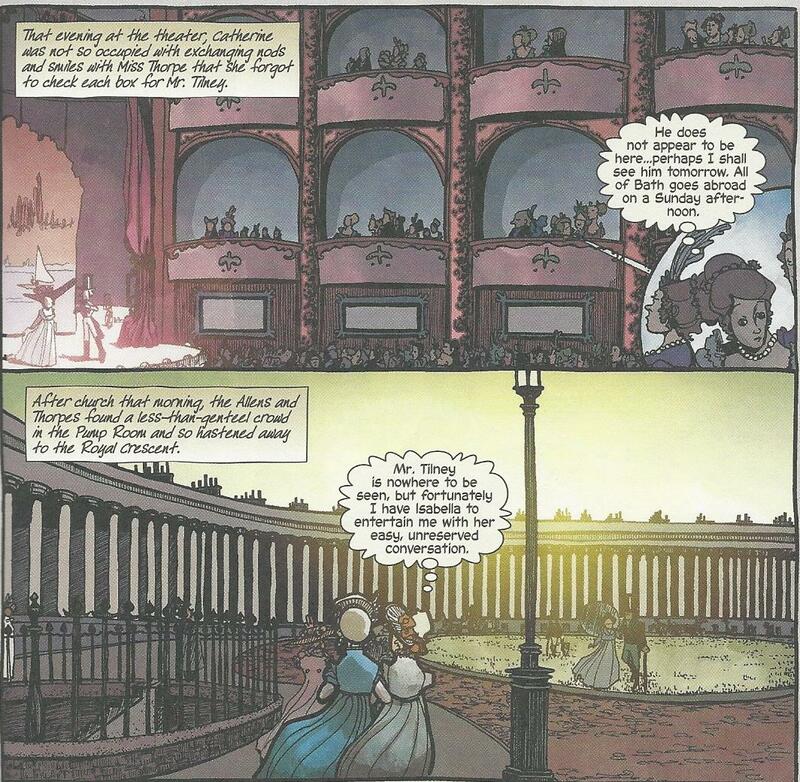 It’s obvious that Posy Simmonds and Audrey Niffennegger’s graphic novels are art, Simmonds’s images are so distinctive — and Niffennegger’s spun art in the manner of artistic poem books. These Marvel books are not so; they are deliberately set up in frames and use typologies resembling more comic book images — probably not to put off the comic book buyer. I can’t say that all Marvel comics are genuinely good; and I know some of the recent autobiographical graphic novels rich on text are poor on images (which makes them poor graphic novels), but these are worth perusal. As with Posy and Niffennegger, one aspect of the enjoyment is the text. 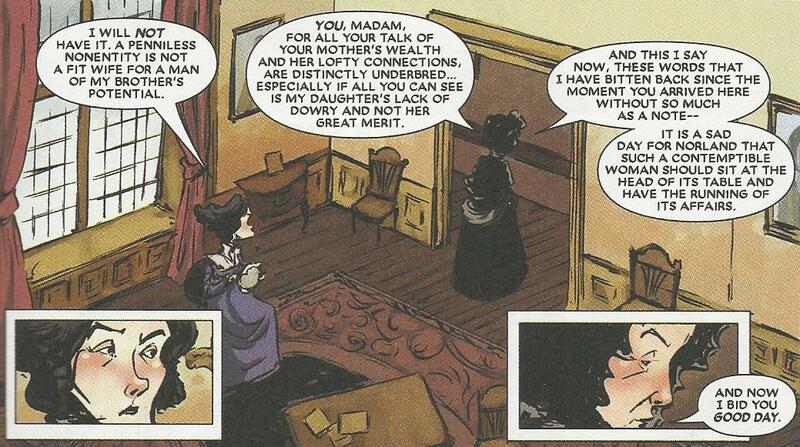 In both cases Butler is the writer and she choses wisely to take as much from Austen’s text straight as she can. I once had a publisher tell me when you publish about Austen let your guide by to quote her when you can. You are sure to please that way. 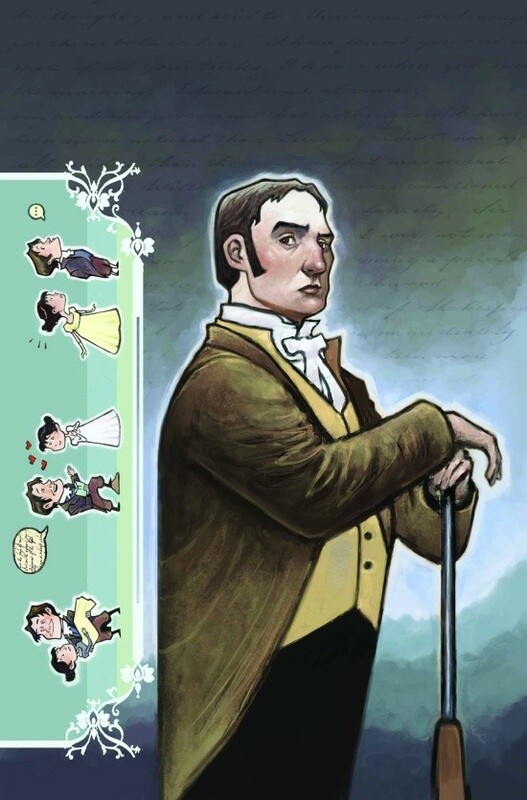 So you are reading Austen epitomized, in bits and pieces, sometimes altered and expanded with piquant details, often from the era, but they are well chosen. The pictures matter of course, maybe more than the words. 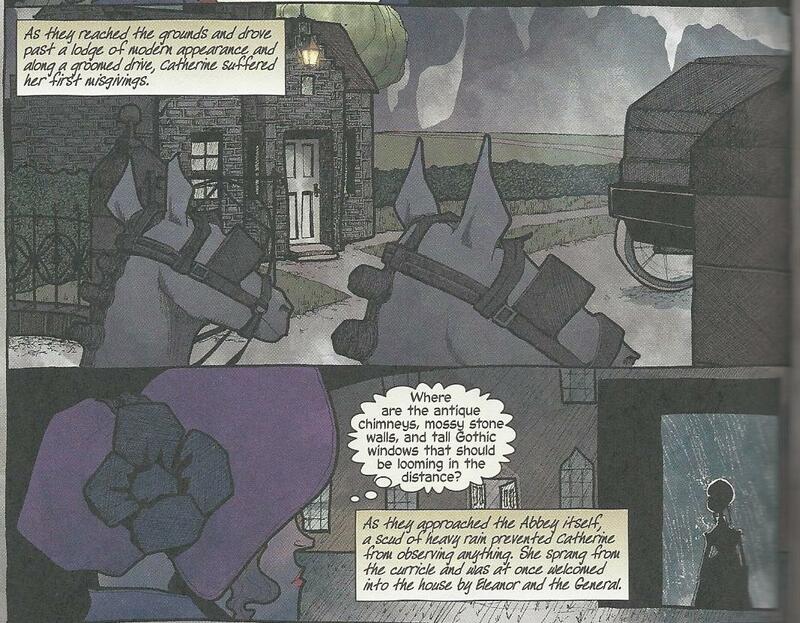 In the case of NA I was surprised to find very dark colors used for Bath itself, Bath made gothic, with overlarge oddly angled depictions of the characters (so we are inside their minds), haunting kinds of shapes for what happens. In the case of the S&S, there are zoom shots, the characters look so overawed and powerless against the screens they are caught in, especially Mrs Dashwood in her widow’s garb, at a kind of great distance angle of shot from on high, very sudden too. 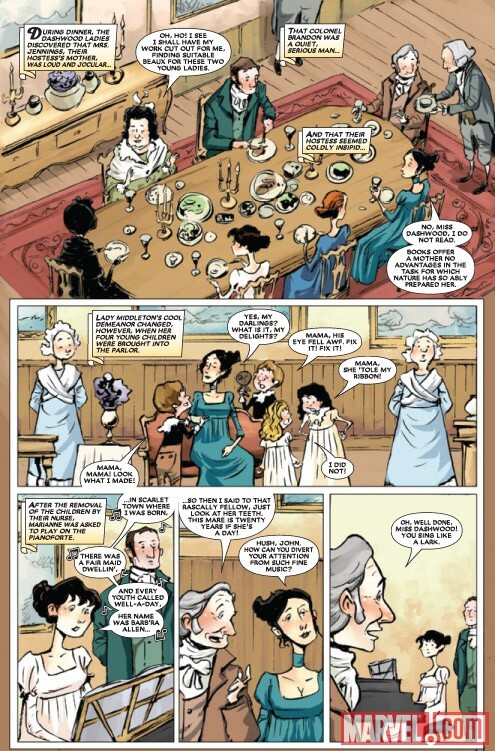 In the S&S panel you see the characters drawn as on a stage from different angles and then squares within squares with faces close up, so tensions from social life come out: in the preface to S&S Butler speaks of the book as about sisters, and outrage over the way the Dashwoods are treated by the laws and when they arrive in Devonshire custom. Butler and Lee’s S&S takes off from the movies. Yet at the same time similarly there is a particular interpretation which is Butler and Liew’s own and it’s poignant because of the high shots. 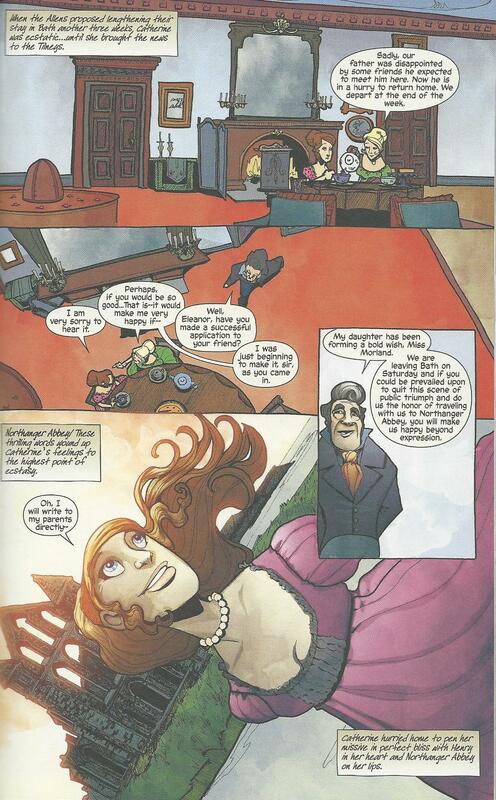 It’s more daylight mind (Molinari did the colors) here than the Marvel NA, with normal perspectives on the size of the characters (they don’t overwhelm a page) and the background made into light of the day or quiet of an evening so there is a quieter feel to the work. 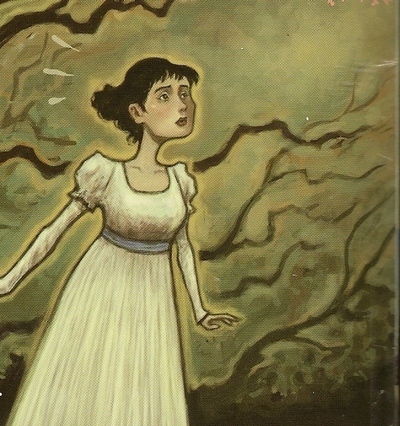 I have read a previous graphic novel adaptation of Northanger Abbey (words Trina Robbins, illustrator Anne Timmons): a Gothic classics volume which contains 5 novels so each one is shorter (it includes Ann Radcliffe’s Mysteries of Udolpho, words Antonella Caputo, illustrator Carlo Vergara); I want to say that the pictures are in black-and-white makes them limited only I know that Posy Simmonds makes beauty, gives depth with drawings on white too. I think it’s the wild angles of the frames themselves, sudden thrusting and most of all that the gothic is kept to throughout. Also the use of Austen’s words: in the NA and S&S both occasionally Andrew Davies’s superb perceptive scripts. I probably enjoyed them strongly because I’ve not been reading Austen in a while and when I return (I am grateful this is so) after having been away for a while, I forget all the outside materials I read about Austen: while some adds and enriches, so much is said or has been that to say something new or different (which is required) mars the experience because it’s so intermixed with the critic-writer’s political/social point of view and my feeling of how this book is supposed to operate for them in the Austen world, or just things that are said that are a new extreme and grate, or simply ignore the book altogether or mock it (in effect it’s so over-the-top in its reactive reading) though the person writing does not always know that. I should not have been surprised as I love studying film (and films are moving pictures), loved art history and see pictures as endlessly meaningful when well done. 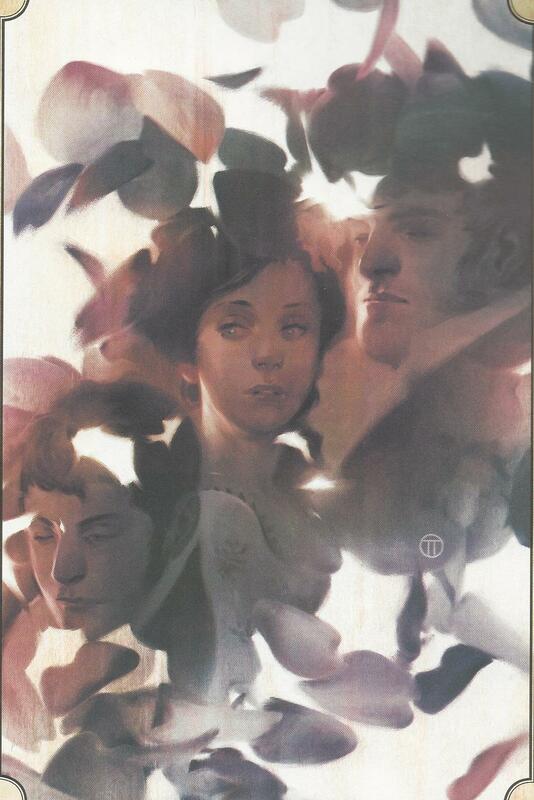 In this Marvel NA, we have many narrowed eyes, on the male and female faces, suggestive; in this S&S really detailed developments out of Austen via different movies. My daughter Izzy bought the Northanger Abbey one on Sunday, November 1st, and we said it was appropriate to the season and All Saint’s Day — which for me would have been very lonely but for her and my two cats – and Austen and memories of the Austen movies.